Starring: Susan Cagle, Jenn Dees. Jared Asato, Mark DiConzo, John Weisenburger, Jeremy Koerner, Vanessa Streiff, Kether Donohue, Molly Ryman, Bridget Trama, David Winning. My Thoughts: As a film critic I see one to two films on a daily bases, which for the most part can be fun, however sometimes it can be rather agenizing due to the countless hours spent watching films that don’t deserves the time of day for my or anyone’s attention, however every once in a while there comes a film that is unexpectedly breath taking and emotionally powerful, one that grips the individual into its world of wonder, if you don’t know what I’m talking about than it’s pretty obvious that you’ve never seen a good film, than alone appreciate the fine art of filmmaking. For me that moment of cinema satisfaction was New York Lately, a film written and directed by independent new comer Gary King, New York Lately is a film that grabs a hold of its viewers and takes them on a journey deep into the lives of a group of individuals dealing with their unhappiness one day at a time, the film proves to be strong on a emotional level with a deliciously divers blend of drama meets humor, as a fan of the fine art of Indy filmmaking I was captivated by this film from start to finish, the plot is covered with levels of atmosphere that continues to have layers of depth within itself, as the saying goes a picture carries a thousand words, well if that so than this film topples that tenfold with every shot with a fantastically written screenplay that can’t be fully understood through an explanation but rather being experienced firsthand, the film moves through its various stories without attempting to make a single character or story anymore meaningful than the rest, it is much in the same theme as the movie “Crash” with not trying to make one single entity conquering over the other, but instead giving its audience a generalize principle of the pursuit of finding happiness, and the loneliness many feel in the process, in short this film is what independent filmmaking should be, the fact this film was made with a small budget of only a $100,000 is astonishing and quite frankly impressive, because if I didn’t know any batter I would have thought this film was made with a much larger budget then a hundred grand, but that only future proves my point that Mr. King is… well, The King! Unlike other filmmakers who have a ridiculously large budget to play with and still end up making a film hardly worth being paid to see (trust me there’s a lot of them out there), King shows that a worth watching film doesn’t need a large budget, nor does it need an all-star cast of A-list celebrities, with that said it goes to show that with the right script, the right cast, and the right director put behind it anything is possible. What New York lately reminded me of was the old days of movie making, when making a fil m was more than just making the big bucks, it was more than just trying to rush a film out so that the revenue could start rolling in, and it certainly was more than just trying to win awards, what it used to be about was a message to it’s viewers, may it be good or bad, for better or worse, directors of the past would set forward to make a film that had a message, or better yet, an ideal, it’s what filmmaking was all about, it didn’t matter if it made money, or if it won awards or not, rather the masses liked it or not it didn’t matter, just knowing that people went out to see it was its own reword, now days directors have forgotten that, they have strayed away from the morals and ideals of filmmaking, but not King, though new to the business he obviously knows that making films is more than just filming a story scene for scene, but about expressing one’s self through art in each and every scene, and what we get is a decent plot that moves nicely along as the story unfold, and a cast that is spot on goodness, and a scores setting that is perfect for the overall mood of the film, and the most important part is the fact this film is (unlike a lot of films seen this year) unpredictable makes me giddy just saying it, yes that’s right I said giddy, as a film critic who watch an average of one sometimes two film a say I have become quite the expert of predicting the outcomes of situations in films long before they ever arise, and because of this sometimes the films can become more of a chore than a pleasure, but not this film, no, not by a long shot, the fact I was unable to call it was impressive because it shows there are still undiscovered talents left out there, the only problem I had was (that is if you can call this a problem) I did not want the film the end, seeing these characters through their victories and happy ending, to their dark decisions and unfortunate defeats, you can’t help but feel as though you’re a part of their lives, like you’ve been there beside them the whole journey, I guess this is due to the fact Mr. King has built a stylish atmospheric world of character that we all can relate to in one form or another, and because of this I can see nothing but good thing for him in his career, so to the once hotshot Indie director’s, Woody Allen, Steven Spielberg, watch out! A new comer has arrived to the scene. 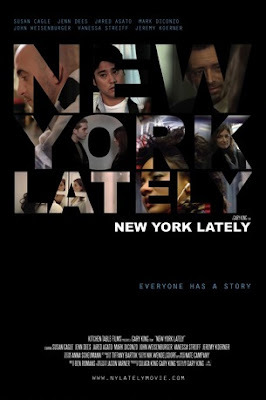 T he story is about; a group of everyday people, living everyday lives living in New York city, each must fight their own battles of unhappiness, trying to find their own piece of happiness. Jared (Jared Asato), an unhappy corporate employee, grapples with his conscience on doing what is right for the company versus what is right for himself. Truly (Susan Cagle), an aspiring singer, struggles to create one meaningful song in her life while trying to maintain old friendships and new. Veronica (Jenn Dees), a self-conscious actor, works odd-Jobs looking for her one big break, until she gets it, Mark (Mark DiConzo), a voice-over performer, obsesses over the recent break up with his girlfriend Andrea (Molly Ryman), perhaps a little too much. Ringo (John Weisenburger), a self-proclaimed “know it all” when it comes to ladies hides an unexpected secret. Suspecting his wife of infidelity, Elliot (Jeremy Koerner), a one-time bestselling author, hires a spunky privet detective named Sam (Vanessa Streiff) to collect the incriminating proof only to discover more about himself than anything else. As for the acting; it’s hard for me to judge the acting because to be completely honest, the cast as a whole was great, but I will however say a few things about some of the cast and the characters they played. Susan Cagle was amazing as Truly, her acting was nicely done, not over the top and not underdone, she is also a wonderful singer, listing to her singing as the credits roll was more than worth it. Jared Asato was fantastic as Jared, I could really see the harsh agony he went through doing a job he didn’t want to, Jenn Dees great, her pretrial of a struggling actress was spot on, not many people know the kind of things actors and actresses have to do or go through to get where they are in the business. Mark DiConzo did a great job, in my opinion I think his character really stood out, the pain of loving someone who no longer feels the same way is probably one of the most painful things to experience, and DiConzo did this spot on with great integrity and depth. John Weisenburger did a nice job, his character gives the viewers a few good laughs as well as a few touching moments, I don’t know why but for some reason Weisenburger reminded me a lot of actor Edward Burns, could be they look a little like each other, you decide. Jeremy Koerner was outstanding, I could really feel his character’s misery, and living with someone who you suspect is cheating on you with someone else can be a real emotional train wreck for anyone, and Koener did this role with great skill. I found Vanessa Streiff to be simply adorable, her acting was quite nicely, and her character is just one of those you can’t help but love. Kether Donohue, Molly Ryman, Bridget Trama, and David Winning, all did great jobs. Like I’ve stated earlier, all these actors gave magnificent performances that is hard to judge individually. Final Say: overall I had a fantastic time viewing this film, the movie had a spot on cast with a spot on director, the film showcases the talents of an upcoming director as well as rising stars, and watching New York Lately was basically watching the talents of stars filmmakers of tomorrow, I can tell you now that these people will be somebody’s in the near future, I highly recommend!